The mechanical properties of wood can be improved by compressing its porous structure between heated metal plates. By adjusting the process parameters it is possible to target the densification only in the surface region of wood where the property improvements are mostly needed in applications, such as flooring. The compressed form is, however, sensitive to moisture and will recover to some extent in high humidity. 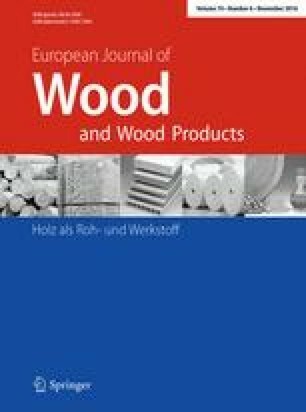 In this study, therefore, acetylated radiata pine was utilised in the surface densification process in order to both reduce the set-recovery of densified wood and to improve the hardness of the acetylated wood. Pre-acetylation was found to significantly reduce the set-recovery of surface densified wood. However, after the second cycle the increase in set-recovery of acetylated wood was relatively higher than the un-acetylated wood. The acetylated samples were compressed by only 1 mm (instead of the target 2 mm), yet, the hardness and hardness recovery of the acetylated samples significantly increased as a result of densification. It was also discovered that rough (un-planed) surfaces may be surface densified, however, even if the surface became smooth to the touch, the appearance remained uneven. The authors would like to acknowledge Accsys Technologies for providing the wood material for this study. The authors would also like to thank Joachim Seltman (SP, Sweden) and Joonas Kanerva (Aalto University) for technical support. The study was supported by the EcoBuild Centre, Stiftelsen Nils och Dorthi Troëdssons forskningsfond and the Finnish Cultural Foundation.